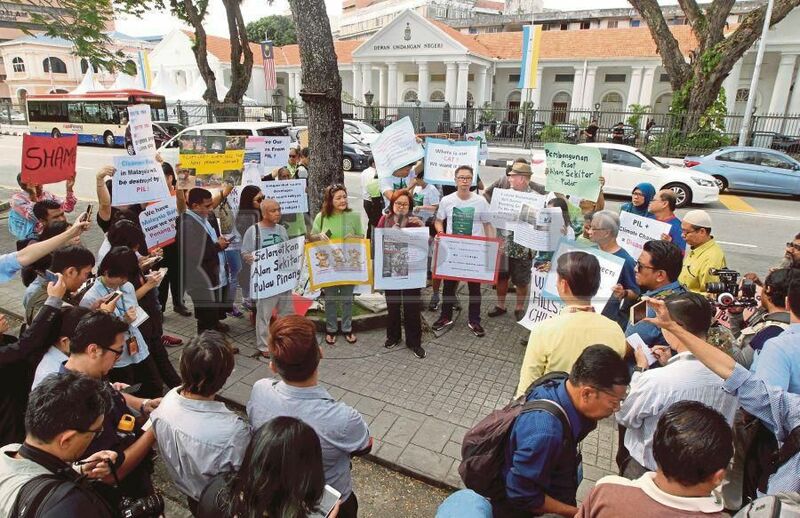 GEORGE TOWN: Environmental non-governmental organisations (NGOs) have vowed to continue staging protests against the Penang government if it pushes ahead with hillslope developments and mega infrastructure projects in the state. They also reminded Chief Minister Chow Kon Yeow’s administration of former chief minister Tun Dr Lim Chong Eu’s ‘fall from grace’ in the 1990 general election when he expressed his intention to push for the development of Penang Hill. Penang Forum committee member Khoo Salma Nasution said they will never agree to the massive Pan Island Link (PIL) highway projects, let alone the multi-billion ringgit Penang Transport Master Plan (PTMP) project. She also asserted that they are strongly opposed to Penang’s numerous hillslope development projects, particularly after the recent Bukit Kukus landslide, which claimed nine innocent lives. “We will also oppose the construction of two hotels on the peak of Penang Hill as announced by (YAB) Chow yesterday. That is certainly a ‘no no’ for us at all costs. Who is behind these hotel projects? We are certainly not happy (over this). “Last year alone, more than 200 landslides were reported around the state. Isn’t this a sign and wakeup call that enough is enough? “Just remember that if we continue to disturb the hills, they will turn around and (take revenge on us) in future,” she said during a protest outside the state legislative assembly this morning. More than 30 representatives from various NGOs joined in the protest to voice their unhappiness with the state’s development policy. They held banners which read “Landslides Happening all over Penang – Natural or Man-made”, “PIL + Climate Change = Disaster” and “Where is our CAT? We want it back”. “CAT” is a reference to the state government’s acronym motto of Competency, Accountability and Transparency. The NGOs quip that “CAT” now stands for Complacency, Arrogance and Translucency. Yesterday, Chow revealed plans to build two hotels on the peak of Penang Hill, one behind the Convalescent Bungalow and another on the hillslope along the Coolie Lane. He said that the proposed hotel behind the Convalescent Bungalow is in the design stage and vowed that it would not be higher than what was set out in the Penang Hill Special Area Plan; while the other hotel is still in the planning stage. Khoo Salma asked if there is really a need to build hotels on Penang Hill. She added that the state government should not use ‘false figures’ to justify the numerous development projects in the Penang Structure Plan (PSP). “The state claimed that the population will increase to 2.45 million in 2030. But that claim is not (corroborated) by the Department of Statistics,” she noted. Khoo Salma stressed that the strong mandate given by Penangites to the DAP-led administration in the 14th general election is ‘no licence’ for the state government to do as it wishes. “We just wanted to vote Barisan Nasional out of power. But it is certainly not an (endorsement) of the numerous hillslope development projects, or even the mega infrastructure projects (in the state). “All we want is the freedom to voice out (in order) to help the state government solve its problems – but they would rather turn to the developers. That is the main issue here,” she added. Meanwhile, the Preservation of National Heritage (Peka) national exco member Pam Ooi said that she is saddened by the state Penang is in now, so much so that she decided to join the NGO to voice out her opposition to further destruction of her hometown. “Penang is very much destroyed now and we must stop if from further rot. “You, youngsters, will never know how beautiful Penang used to be. Now, I cry looking at the bald patches on Penang’s hills. It pains me,” she said.